More than a year after President Trump promised a "complete review" to revive the country's domestic nuclear energy sector, the effort remains shrouded in mystery. There have been no public announcements or updates. Reactors across the United States have continued to shutter. And lawmakers from both sides of the aisle have said they know little — or worse yet, can't get answers from the administration. But industry insiders familiar with White House discussions say the Trump administration is indeed moving forward with a full-scale review of the nation's civil nuclear program. Whether it's been a success depends on whom you ask. "It's still going on, but it lost a fair bit of momentum," said one industry source in regular contact with administration officials. "It's a little bit of a black box, and it's difficult to ascertain whether progress is being made." So what exactly is Trump's "nuclear review," and what has it accomplished? Sources say the effort is multipronged, centers on action at the Energy Department, and is being fleshed out and directed at the highest levels of the administration under the leadership of Aaron Weston, a nuclear engineer and former House staffer on detail from DOE. The review is focused on four areas: the current operating fleet, technology and innovation, the fuel cycle, and international exports. That includes everything from pushing the continued development of small reactors on military sites to supporting new ways of manufacturing reactor fuel. It also includes controversial policies that have so far floundered in attempting to thwart the closure of nuclear power plants in unregulated markets facing competition from cheap gas and low demand for power. Despite those setbacks, nuclear boosters say they're already seeing fruits of the administration's labor and have hope for the industry's future. "It's ongoing, it's active, it's tactical and focused on driving the interagency process through presidential memorandum decisions," David Blee, executive director of the U.S. Nuclear Industry Council, said of the review. "It's been effective in things coming out of the DOE, and there's a lot work in progress for 2019." The White House was not immediately available for comment. DOE indicated that the review was part of its broader strategy to promote the deployment of nuclear energy. "The Trump administration is committed to reviving and revitalizing the nuclear industry in America," DOE spokeswoman Shaylyn Hynes said. "Secretary Perry has made it a priority for DOE to support innovative and advanced nuclear energy technology in order to deliver clean, safe and reliable energy both in the United States and across the globe." Even before George David Banks began his tenure as Trump's top energy aide tackling international issues in early 2017, he flagged a desire to launch the civil nuclear review. In January of that year, he published a paper laying out his vision for a civil nuclear review while serving as the executive vice present of the American Council for Capital Formation, a pro-business think tank. In his new White House role, discussions about the fate of nuclear were punctuated beginning in April 2017 with the bankruptcy of Westinghouse Electric Corp. and the subsequent problems that new reactor projects faced in Georgia and South Carolina. Those challenges threw into question the continued U.S. role in the global market for civil nuclear energy and the certainty of building large reactors in domestic regulated markets. Trump, said Banks, understood the strategic value of the nation's domestic nuclear program and supported preserving those assets. "The president is a student of power politics," said Banks. "He views our civil nuclear program as a strategic asset, and has expressed a willingness to directly preserve those assets." In the summer of 2017, Trump told a room full of industry executives at DOE headquarters he wanted to "revive and expand our nuclear energy sector — which I'm so happy about — which produces clean, renewable and emissions-free energy" (Energywire, June 30, 2017). Banks said there was never any plan to release a big study or paper that might have been put on the shelf. Instead, the effort was designed to be nimble, to have a "rolling" process with related pieces introduced via different types of announcements and venues over time. It also allowed the administration to react quickly to external developments, domestically or internationally, he said. Banks, who served as Trump's special assistant to the president on international energy and environment until resigning in February 2018, launched the review alongside Mike Catanzaro, who handled domestic energy issues. "Mike and I worked together to advance the president's agenda in the most comprehensive manner possible, merging both domestic and international agendas through the NEC [National Economic Council] and NSC [National Security Council]," he said. Banks acknowledged there are questions about the review's fate but insisted it's in full swing. "I know some people say, 'This thing has been going on forever, where is this going, where's the end product?'" Banks said. "It was never designed to be some flashy thing; it was designed to look at our national policy comprehensively, provide guidance to the agencies and to get things done whenever possible." Such questions are rampant on Capitol Hill. That's because lawmakers appear to have largely been left out of the process — a potential sign that the administration may look to do whatever it determines is needed on its own. "I don't think it's telling, but I do think it's something we need to look into," Rep. Bobby Rush (D-Ill.) told E&E News. "Nuclear is still on the table, so we need consider all the options." Republican Reps. Fred Upton of Michigan and Mike Simpson of Idaho also said they'd heard nothing about the status of the review. One Hill staffer familiar with DOE's efforts described the report and its future as "very limited, if not nonexistent," citing the lack of interaction with congressional policymakers. Those frustrations and lack of communication with Hill allies boiled over in May 2018 during an Energy and Commerce subcommittee hearing on nuclear energy. During that hearing, Rep. Morgan Griffith (R-Va.) pressed Ed McGinnis, principal deputy assistant secretary for DOE's Office of Nuclear Energy, on the status of the review and how it was being conducted. McGinnis was mum on concrete answers but did say DOE was involved and the process was moving forward. "I do not know the answer to that other than the fact I can tell you that we have attended quite a few meetings, very substantive," McGinnis responded to a question about the timing of the report. "We have made significant progress. "I can also say that our charge at the department was not to wait for any completion to be able to do things we can do now," he added. "Whether that's loan guarantees, whether it's the notice of proposed rulemaking, whether it is industry quotas or supporting the revitalization." Despite the apparent lack of interaction, Congress has moved some policies to support nuclear energy. At the end of last Congress, lawmakers were able to pass legislation from Sen. John Barrasso (R-Wyo.) that would require the Nuclear Regulatory Commission to develop a regulatory framework for advanced nuclear technologies as well as overhaul the way it works its budget and fee programs (E&E News PM, Dec. 20, 2018). Trump signed the bill into law last night. Given the complexity surrounding nuclear issues, Banks said he believes the review has already produced some success. And by that, he means moving toward a more cohesive approach to the United States' civil nuclear policy, be that boosting exports or halting the closure of plants within the U.S.
"These issues are really complicated. It takes awhile to work through the system," he said. "Like everybody, I would have loved to see things move faster, with more tangible outputs," said Rich Powell, executive director at ClearPath Foundation. "I do think this administration has done more on nuclear than the previous administration. It's kind of up there with the second Bush administration." Other sources pointed to DOE's $3.67 billion in conditional loan guarantees to companies building Plant Vogtle in Georgia that has fallen years behind schedule and is billions over budget. They also cited the agency's announcement earlier this month to launch a $115 million, three-year demonstration project in Ohio to provide a domestic source of advanced nuclear fuel for powering the next generation of nuclear reactors (Energywire, Jan. 8). Another example, they said, is DOE's active research and development of advanced nuclear reactors, mainly focusing on cost-sharing programs with private companies to get designs to the NRC licensing phase. One of those companies, NuScale Power, announced it had advanced through one of the most strenuous phases in the NRC's design certification review process. Energy Secretary Rick Perry has also been involved with the negotiations on a "123 agreement" with Saudi Arabia, which would enable U.S. nuclear technology to go to that country. Negotiations have become more complicated in the fallout of the slaying of Saudi journalist Jamal Khashoggi, likely at the hands of Saudi-directed operatives (E&E News PM, Dec. 19, 2018). And one top DOE official said earlier this year the agency is looking at hybrid plants that would combine small nuclear reactors with wind and solar. But experts question how much the Trump administration could boost domestic nuclear construction through potential policy changes. DOE's pitch for federal lifelines for struggling coal and nuclear plants fell flat at the Federal Energy Regulatory Commission last year, and subsequent efforts appear to have fizzled out. It's unclear whether the Trump administration will assemble a new majority at FERC that might react differently to a request for assistance based solely on nuclear energy and its ties to national security. Paul Patterson, an analyst with Glenrock Associates LLC, said the future of nuclear power will be heavily influenced by economics in the absence of major government intervention. "I don't think you're going to see new nuclear being built really for some time, certainly until probably after the Vogtle plant is dealt with and people have a better idea about what the actual cost is," Patterson said. Indeed, the review is likely to have little impact on the Southeast, a region dominated by regulated electric utilities. The region can boast housing the nation's lone nuclear construction project — Southern Co.'s Plant Vogtle in southeast Georgia — but all of the other electric companies, including Duke Energy Corp. and NextEra Energy Inc.'s Florida Power & Light Co., have shelved or delayed their plans. The chief reason comes down to cost as well as a general industry transformation away from large baseload power plants, especially because electricity demand is flat. But a review could help in other ways. Southern and others are looking ahead at the next generation of reactors, namely in the form of research and public-private partnerships. Electric utilities also have invested money in increasing the output of their existing reactors or plan to ask federal regulators to extend their operating licenses. 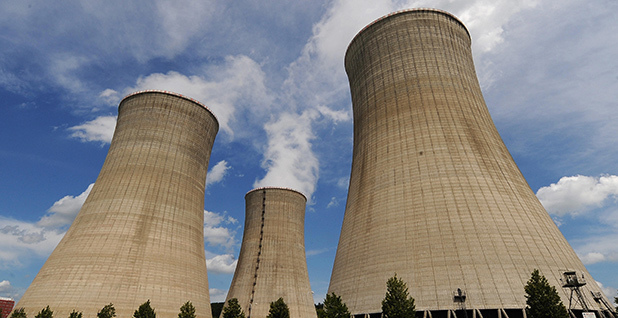 Tennessee Valley Authority, the nation's largest public utility, wants to add small modular reactors to its fleet at some point. Other deregulated states, including Illinois, New York and Connecticut, have turned to measures to subsidize at-risk nuclear plants, while companies such as Exelon Corp. and FirstEnergy Solutions Corp., the bankrupt generator that last year announced plans to close three nuclear plants in Ohio and Pennsylvania, are lobbying legislatures in those states for similar treatment. In Ohio, the company is behind a campaign to influence lawmakers to again take up a bill to fund reactors through zero emission nuclear (ZEN) credits — a funding mechanism similar to what's been approved elsewhere. The bill introduced in the fall of 2017 has so far stalled in Ohio, and especially after former Ohio Gov. John Kasich (R) indicated he didn't support the idea of consumers paying hundreds of millions of dollars a year in nuclear subsidies. One such proponent is Lake County, Ohio, Commissioner Jerry Cirino, who's working on behalf of the Ohio Clean Energy Jobs Alliance, an FES-backed group of elected officials, labor unions and others, and hoping for new language to boost the state's nuclear. "We are looking forward to working with [the Legislature] in the first half of this year on a piece of legislation that will preserve the economic and environmental benefits that these plants provide to the state," said Cirino. Reporters Edward Klump, Kristi E. Swartz and Jeffrey Tomich contributed.